Until recently I never considered myself a creative person, and I certainly never considered myself an artist. However, I recently realized that I create art through words. I guess that makes me an artist. As such, that means I’m studying art (writing) and I immerse myself in art appreciation (reading). 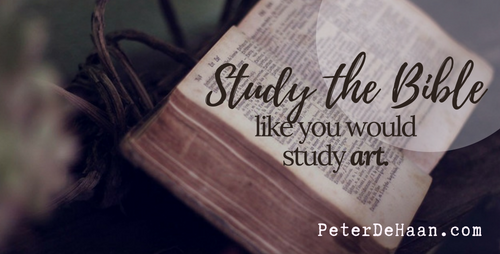 We can apply this idea of studying art and art appreciation to studying the Bible and appreciating its words. If we race through an art gallery with the goal of covering the most exhibits in the shortest amount of time, we miss the point of art. We fail to appreciate it for what it is. So it is when we study the Bible. We must spend time with it and not race through it. I sometimes fall into this trap when I set the goal of reading the entire Bible in one year. There are days, sometimes weeks, when I focus on the number of chapters I’ve read and not on the meaning of the words they contain. Yes, there’s benefit in looking at the Bible in huge chunks, but the real value comes from when we tarry to spend time focusing on a single passage, verse, or even phrase. To get the most from the Bible, like art, we must spend time to really look at it. To fully appreciate a work of art requires that we look at it from different distances and not just from a typical viewing space. That means after our first perusal, we may want to step back and consider it from a distance. It also may mean going in close to scrutinize certain sections or to consider the artist’s techniques. We can apply the same practice when we consider the Bible. Start with a normal read of the passage. Then pull back to look at its overall context, both within that particular writing as well as within its place in history. Last zoom in to look at the details, a particular phrase or even word choice. Each one carries meaning, often profound. With a quick read we’ll zip right past these treasures without ever noticing their presence or their implication. A third recommendation when it comes to art appreciation is to look at a piece from different angles. Though this applies to paintings and other two-dimensional art, it’s even more valuable with sculptures and three-dimensional creations. Each viewing angle provides a different perspective on the piece, sometimes complementing other angles and other times contrasting or even conflicting. Sometimes these different angles reveal enigma and paradox. How cool is that? As we study the Bible, we can also consider it from different angles. We start with the words and what they mean, which often reveal multiple meanings. We can consider the author, the audience, and the point of view. We can look at the type of writing and the purpose of that writing. As we do, we see the beautiful and compelling nature of Scripture as it emerges with enigma and paradox. Embrace it. When we make return visits to an art gallery or a particular piece of art, we see new things we missed before: a nuance, a texture, a color. We also can interpret a piece of art differently based on our perspective. Since our lives change continuously, as do the situations we find ourselves in, our understanding of art shifts along with our life experiences and perceptions. Even though I’ve never heard of a Bible Appreciation class, we can take lessons from Art Appreciation and apply it to our study of the Word of God.